Q: The ROK and Chinese chief negotiators for the Six-Party Talks held a meeting in Beijing today. Could you tell us what has come up in the meeting concerning the situation on the Korean Peninsula and the denuclearization of the Peninsula? A: Vice Foreign Minister and Special Representative of the Chinese Government on the Korean Peninsular Affairs Kong Xuanyou met with Special Representative for the Korean Peninsula Peace and Security Affairs of the ROK Ministry of Foreign Affairs Lee Do Hoon in Beijing today. According to what I have at my hand at this point, the two sides had an in-depth exchange of views on the situation on the Korean Peninsula and the political settlement process of the Peninsula issue. I will keep you posted if I get more specifics for this. Q: On the sidelines of the Asia-Europe Meeting, Premier Li Keqiang met with French President Macron. Do you have more details? A: On October 18, Premier Li Keqiang met with French President Emmanuel Macron on the sidelines of the Asia-Europe Meeting (ASEM). The two leaders exchanged views on bilateral relations and other issues of mutual interest. During the meeting, Premier Li Keqiang pointed out that the Chinese side stands ready to work with the French side to expand two-way opening-up, promote sustained and balanced growth of trade and investment, and bring more positive expectations for businesses in our two countries. He also clearly said that the China-EU investment treaty negotiations and China-France trade and investment cooperation can be advanced in parallel. The Chinese side will firmly support the solidarity, stability and prosperity of the European Union as it always does. In face of complex international situation, China stands ready to work with France and the EU to uphold the rules-based multileralism and free trade system. President Macron said that France is willing to maintain high-level exchanges with China, map out the roadmap for future trade and investment cooperation as soon as possible, and forcefully advance the two-way trade and investment between our businesses. The French side hopes to further deepen practical cooperation in such areas as nuclear energy and agriculture for mutual benefits and win-win results. He also stressed that the French side firmly supports multileralism and is willing to continuously maintain and strengthen communication and coordination in international affairs with China. China-France relations enjoy sound development. President Macron and Prime Minister Édouard Philippe paid successful visits to China this year during which new consensus and outcomes were reached for further development of bilateral relations and practical cooperation. China stands ready to work with France to chart the couese for our high-level interactions going forward and promote the long-term sound and steady development of China-France relations. Q: First, regarding the China-ASEAN joint maritime exercises, the Chinese Navy had its first-phase desk-based joint military exercises with ASEAN in August and plans real exercises at sea next week. Why is China seeking joint military exercises in Southeast Asia? Second, a draft of the negotiating text for the Code of Conduct for the South China Sea (COC) has inserts from China that would prohibit the holding of military exercises with countries from outside the region without permission from other countries in the region. Does China want to exclude the US or other countries from conducting joint military drills with ASEAN? A: As to your first question, the Spokesperson of the Ministry of Defense already gave some information on that. As far as I know, China and ASEAN countries will conduct joint maritime exercises in Zhanjiang, China and waters off it. The ASEAN-China Maritime Exercise is an important measure for the two sides to deepen defense and security cooperation and enhance mutual trust. I would like to refer you to the Ministry of Defense for more details. Regarding the second question, according to the consensus between China and the ASEAN countries, the consultation process of the COC is an internal process between China and the ASEAN countries, and the relevant situation is not open to the public. I am not sure where you got the information you just cited. Out of a sense of responsibility to the consultation process and to the ASEAN countries, I cannot confirm or disclose any information about the specific content of the text. The COC text consultation has got off to a good start. With the joint efforts of all parties, a single draft negotiating text has been formed as the basis for consultation. We hope that all parties will respect the efforts of China and ASEAN countries to negotiate regional rules and safeguard peace and stability in the South China Sea rather than make unnecessary speculations. Q: According to reports, Russian President Vladimir Putin said at the 15th Annual Meeting of the Valdai International Discussion Club that Russia welcomes Chinese friends to develop the Northern Sea Route within the framework of the Belt and Road Initiative. He added that there is increasingly urgent need for the Belt and Road Initiative, which has received more responses. What is China's response to this? Do you have more details about the cooperation between China and Russia under the Belt and Road Initiative? A: The Chinese side highly appreciates President Vladimir Putin's positive comments on the Belt and Road Initiative and Russia's active support of and participation in building the Belt and Road Initiative. Russia is an important partner of China in promoting international cooperation on the Belt and Road Initiative. In 2015, President Xi Jinping and President Putin signed and issued a joint statement on cooperation in building the Silk Road Economic Belt and the Eurasion Economic Union, kicking off the docking of cooperation between the Belt and Road Initiative and the Eurasian Economic Union (EAEU) which has been progressing steadily. In May, China and the EAEU members signed an agreement on economic and trade cooperation to promote early harvests in integrated cooperation. Under this framework, China and Russia have further aligned development strategies and stepped up practical cooperation in such fields as economy, trade, investment and science and technology. The two sides have also reaped a host of major outcomes in building infrastructure connectivity, including energy pipeline systems. The Chinese side is willing to work with Russia to build the Belt and Road Initiative with focuses on the connectivity of policy, infrastructure, trade, finance and people. 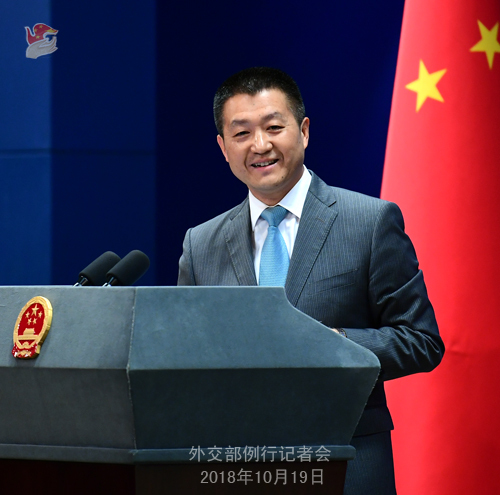 We will continue to align our policies and systems, enrich practical cooperation, expand the building of the sea routes, and jointly forge the Belt and Road Initiative into an important channel for global economic growth and international economic cooperation. Q: It is reported that the United States and ASEAN will hold a military exercise at sea next year. What comment does China have on this? A: I have not seen anything official released by the two sides. If there is any, I will comment on it then. Q: A Chinese leader gave an exclusive interview to CCTV, People's Daily and Xinhua News Agency today. Why did he give such kind of interview? A: I did not quite catch you. Is there any problem with that? A Chinese leader gave an interview to the media on the current economic situation in China and our policies in the financial and economic areas. Anything wrong with that? Journalist: It seemed to come up on a particular day. A: In what way? The US leaders also give interviews every day, don't they? I cannot understand why you think that the interview given by the Chinese leader to the three Chinese media outlets is special. If you find it special, then tell me why and maybe I can help you understand it. Journalist: Some people would say that it showed some degree of worry about the economy. A: With regard to the question on whether the Chinese economy is in a bad shape, I have responded to it before. The officials from competent Chinese departments have also made clear our stance many times. 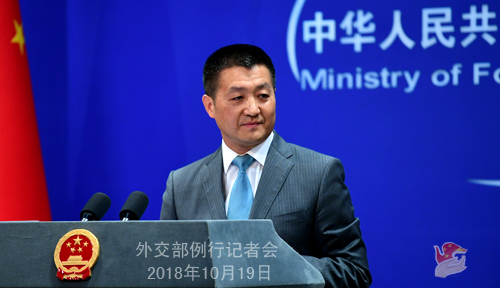 The Spokesperson of China's Commerce Ministry elaborated on the relevant situation this week as well. 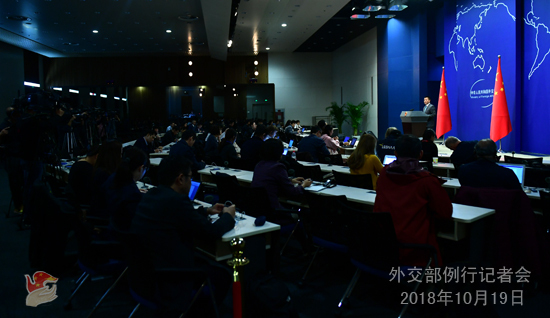 When taking questions from the journalists today, the Chinese leader gave a clear response by going deep into the current economic and financial situation and our macro policies. I would advise you to have a thorough reading of that. You will see the positive factors which have enabled the fundamentals of the Chinese economy to remain sound. You will understand why we are fully confident about the Chinese economy. Q: There is an effort underway by European countries to request more transparency and competition in public tenders for infrastructure projects. Do you have any response to that? A: Are you referring to a specific cooperation project or generally speaking, the overall infrastructure projects cooperation between China and other countries? Journalist: I mean generally, a push for more transparency and competitive bidding in infrastructure projects globally. A: Like I said a couple of days ago, the Chinese side, based on its own development experiences, knows fairly well that infrastructure building and connectivity is a necessary precondition for economic development. It also remains a bottleneck choking the development of many underdeveloped regions at this point. In view of this, the Chinese side, as its capacity allows, has been working on infrastructure building and connectivity cooperation with other countries. projects have been chosen and financing arrangements have been made with the relevant countries under the principle of extensive consultation, joint contribution and shared benefits on the basis of equal consultation. When doing so, we also want to make sure that more cooperation efforts could be made to improve people's livelihood in these regions and enhance those countries' capacity to realize self-driven development. We always maintain that such cooperation should follow the principle of openness, transparency and inclusiveness. We also encourage all other relevant parties, especially the developed economies with ability to help others, to offer much-needed support and assistance to those underdeveloped regions and countries in light of their development needs and with no political strings attached. Q: Do you expect to have the final COC ready to present to the ASEAN meetings in Vietnam in December? A: Like I just said, according to the consensus reached by China and ASEAN countries, the consultation is an internal process and is not open to the public. Indeed, on the basis of the consensus between China and ASEAN countries, we may disclose the progress of the consultation in due course. But at this point, with a responsible attitude towards the consultation process and the ASEAN countries, I still can't confirm anything to you.